IT organizations are increasingly turning toward hyper-converged infrastructure (HCI) solutions powered by Intel® to simplify and speed up infrastructure deployments, ease day-to-day operational management, reduce costs, and increase IT speed and agility. Many use cases such as VDI, Test/Dev, IT Operations, Disaster Recovery, ROBO, Private Cloud, etc. 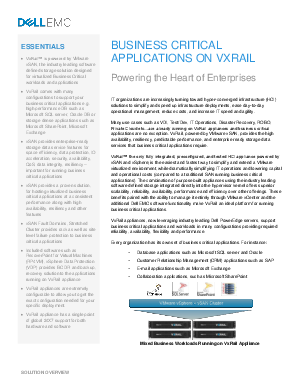 are already running on VxRail appliances and business critical applications are no exception. VxRail, powered by VMware vSAN, provides the high availability, resiliency, predictable performance, and enterprise-ready storage data services that business critical applications require. Intel and Intel logo are trademarks of Intel Corporation or its subsidiaries in the U.S. and/or other countries.